If you are gathering evidence to help make the case for a complete data platform upgrade in 2017, you want to find as much information as possible to bolster your argument. This post is meant to assist you in your efforts. By early-mid 2017, Windows Server 2016 will have been GA long enough to convince most skeptics that it is safe and stable. Windows Server 2016 has many tangible advantages over previous versions of Windows Server, which I will be discussing in future blog posts. SQL Server 2016 already has its first Service Pack available, with many very valuable enhancements (especially for Standard Edition). Some people who are on older versions of SQL Server Enterprise Edition may be able to migrate to SQL Server 2016 Standard Edition SP1. Finally, Intel is due to release the next generation two-socket server processor (which will require new model servers from the server vendors). 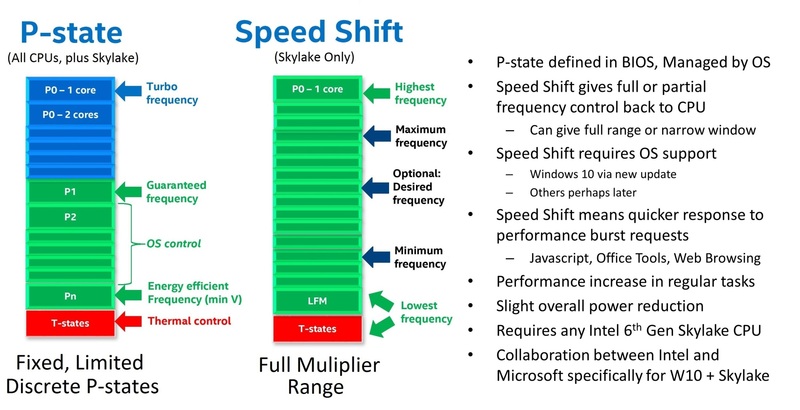 One specific new improvement you will get with a new server/processor and Windows Server 2016 is called Intel Speed Shift. 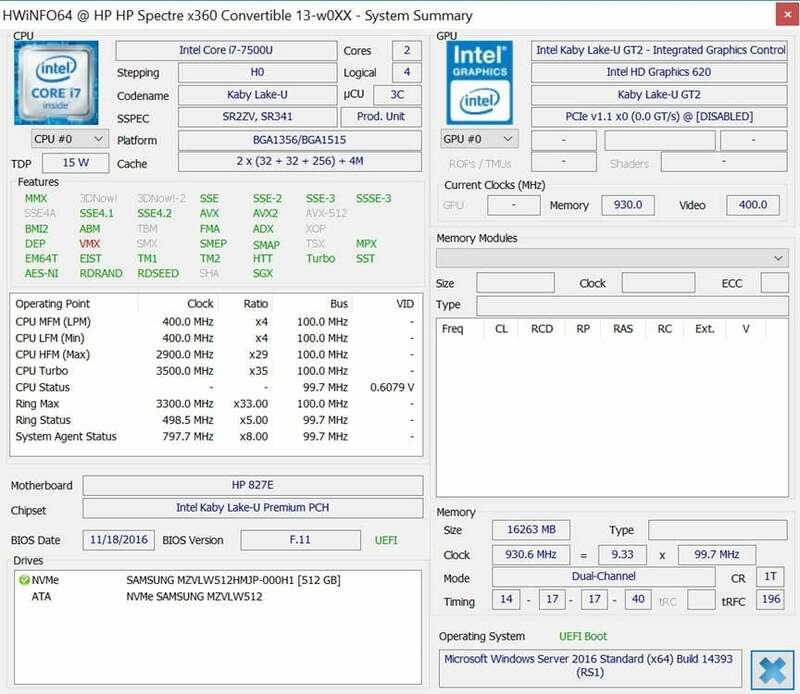 Intel Speed Shift (which is different than the older Intel SpeedStep technology) was added in the Intel Skylake microarchitecture. It requires operating system support in order to work, and the first OS to enable Speed Shift was Windows 10, after an update in November 2015. This feature lets the OS give control of processor P-states back to the hardware, with P-state requests coming from the operating system. This lets the processor increase the clock speed of individual cores much more quickly in response to an OS request for more performance. The upcoming Intel Xeon E5-2600 v5 processors (Skylake-EP) for two-socket servers are due to ship in mid-2017 (although rumor has it that they are already shipping to some cloud data center providers). I don’t know for sure whether Intel Skylake-EP will have Speed Shift like the mobile and desktop Skylake processors do, but it probably will. 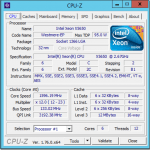 Supposedly, the flagship Xeon E5-2699 v5 will have 32 physical cores, even though you will likely want a lower core count model with a higher base clock speed in most cases, to minimize your SQL Server licensing costs. Why this matters for SQL Server is that many short-duration OLTP queries might run a little faster with Speed Shift enabled. Legacy power management techniques on older processors can take up to 120ms to fully throttle up to full Turbo Boost clock speed, while Speed Shift does it in 35ms, with most of the frequency increase happening in 3-4ms. Figure 1 shows an example of the difference in how quickly the processor can increase the clock speed with Speed Shift Technology. If your operating system supports Intel Speed Shift (Windows 10 or Windows Server 2016) and if you have an Intel processor with Speed Shift Technology (Skylake or newer), then you will be able to get the performance benefits of Intel Speed Shift with virtually no effort beyond perhaps changing a BIOS/UEFI setting on your server. 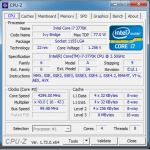 Figures 2 and 3 have some more information about how Intel Speed Shift works. Over the past year, there has been a decent amount of information regarding Intel Speed Shift support in Windows 10, but nothing regarding Windows Server 2016. Part of the problem here is that we already have Skylake processors available in the mobile and desktop space, and in the single-socket server space, but not on the higher socket count server platforms. Just as a quick experiment, I installed Windows Server 2016 Standard Edition on a brand new HP Spectre X360 laptop that has an Intel Core i7-7500U Kaby Lake-U processor, to see if Intel Speed Shift would be enabled or not. 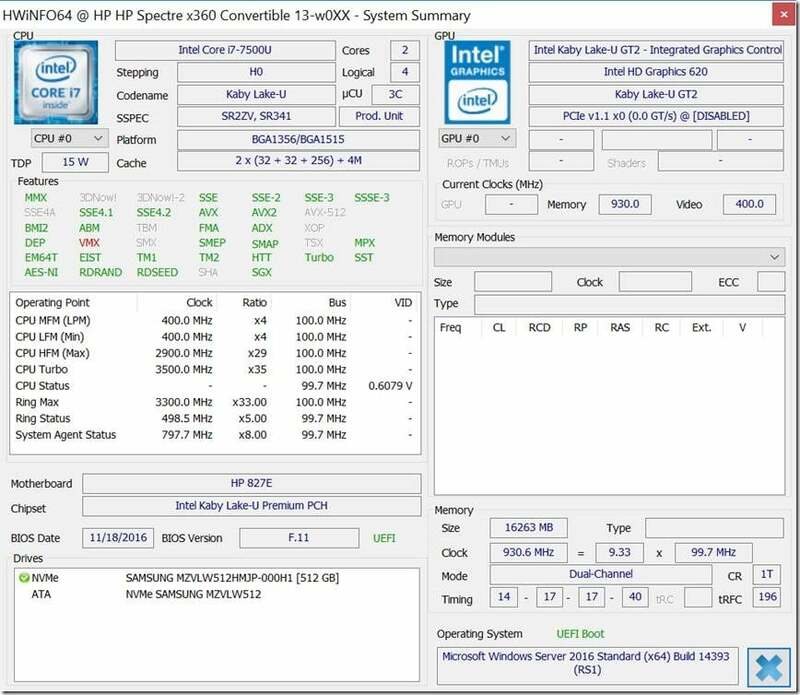 As you can see in Figure 4, the green SST lettering in the Features box on the left side of the System Summary screen in HWiNFO64 shows that Intel Speed Shift is enabled in Windows Server 2016, at least for this processor (which is the next release after Skylake). The outstanding question is how much will this actually help SQL Server performance? At this point, we simply don’t know, without actually doing some testing. Based on some reading I have been doing about Windows 10, I believe there is a way to temporarily disable Intel Speed Shift in Windows 10. Once I figure that out, it should not be that difficult to do some initial testing with short duration queries (150 ms or less) to see if they have lower average durations when Intel Speed Shift is enabled or not. There are many other variables to consider regarding your workload and configuration that will likely affect the results in real production usage, but I expect there will be some positive benefit from this feature. As I like to say in presentations, nobody has ever told me that their database server is “too fast”, so I will take any performance improvement that I can find!